Generating the hydroxyl radical (OH) for the purposes of water treatment, referred to as advanced oxidation, has been studied for several decades.1 When organic contaminants are refractory to conventional water treatment and absorb poorly to activated carbon, advanced oxidation processes (AOPs) may be considered when treatment must be augmented. Ozone and UV-based AOPs have proven the most feasible. Determining which AOP is optimal depends on many site-specific conditions. When a compact footprint is required, bromate formation must be avoided, and the direct UV photolysis of the target contaminant is significant, UV AOPs are favored. In practice, UV AOPs use either medium- or low-pressure mercury lamps to generate OH by the photolysis of hydrogen peroxide (H2O2). 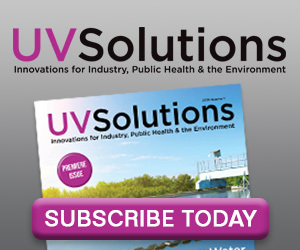 An additional benefit of UV AOPs is that when only needed for short periods – such as in the case of brief taste and odor episodes due to algal blooms – UV reactors that usually provide only disinfection may be switched into AOP mode. This would involve initiating the upstream addition of H2O2 and greatly increasing the UV fluence delivered. In practice, the latter is achieved by increasing lamp power and possibly the ignition of additional lamps. Drawbacks of this approach include the requirement for on-site storage of concentrated H2O2 and the need to quench H2O2 prior to the distribution of treated water. Of a more fundamental nature is the fact that H2O2 itself is a relatively poor absorber of UV radiation in the 200 nm to 300 nm range, such that under typical conditions of reactor geometry and practical H2O2 doses, most radiation is not absorbed by H2O2 and is thus wasted. In the presence of dissolved organic carbon at typical concentrations and humic content, the fraction of radiation absorbed by H2O2 may be as little as a few percent. While direct photolysis of trace contaminants (i.e. < 1μg/L) at wavelengths above 200 nm may be significant in some cases, at 185 nm direct photolysis is expected to be negligible, since even if a compound is strongly absorbing and has a photolysis quantum yield approaching unity, the fraction of 185 nm photons absorbed by such contaminants would be vanishingly small relative to the fraction absorbed by water. What are the requirements of a 185 nm AOP reactor? To transmit the shorter wavelength radiation, the lamp envelope must be free of titanium dioxide or other dopants added to block it when emission at 254 nm alone is desired for disinfection. Such 185 nm enabled lamps are often termed ozone generating lamps, the presence of ozone being immediately apparent upon ignition in the presence of air. No ozone, however, is generated during irradiation of water. The high absorbance of water imposes substantial geometrical constraints on reactor design, in that the entirety of flow must be brought within enough proximity of the sleeves to receive useful 185 nm radiation. Spacing and orientation of lamps and sleeves, and possibly additional static features used to achieve this, may impose frictional losses considerably greater than values typical of UV disinfection reactors. However, considerable opportunity for ingenuity in reactor design exists to address such constraints while also alleviating the head loss penalty. It should be noted that 185 nm is expected to contribute negligibly to microbial disinfection, since those few photons that reach the exterior of cells and viral particles are likely to be strongly absorbed there rather than entering the interior. This may induce some damage to exposed proteins on the outer surface. However, such proteins usually exist as a multitude of identical copies that perform the same function, and damage to a fraction of these is unlikely to be disruptive.8 Meanwhile, the more vital DNA/RNA beyond is effectively shielded from 185 nm. Figure 1. Lowest energy levels of the mercury atom and transitions producing resonance radiation in the low pressure mercury vapor lamp. The low-pressure mercury vapor lamp emits virtually all of its radiation as resonance radiation at the two wavelengths 185.0 and 253.7 nm. These corresponding to transitions of Hg atoms from the lowest excited states back to the ground state, namely 61P1 ➔ 61S0 and 63P1 ➔ 61S0 (see Figure 1). The power emitted at 185 nm is always less than that at 254 nm, with a ratio of 185 nm:254 nm reported in the range of 0.1 to 0.3.9,10 Lamp operation is complex, yet a few comments can be made regarding why this ratio is always less than unity. Decreasing the tube diameter would increase output at 185 nm by reducing self-absorption at the expense of an increased rate of ion-electron recombination at the tube wall. A smaller tube diameter would require a higher current to compensate. While it is possible to increase output at 185 nm by the optimization of the many lamp parameters – tube diameter, current, argon pressure, etc. – the transmission of the conventional lamp will be significantly improved by the relatively simple modification of using synthetic fused silica instead of natural quartz as the envelope material. In work on O3/H2O2 and UV/H2O2 AOPs, many details about the water matrix under investigation may be safely neglected. The situation is more complicated when OH is generated by 185 nm photolysis of water. Major inorganic solutes that are normally transparent above 200 nm strongly absorb at 185 nm, at the expense of water photolysis. These include the inorganic anions chloride, sulfate and bicarbonate that possess strong charge-transfer-to-solvent (CTTS) absorption bands close to 185 nm. Recognition of this phenomenon was absent from a recent review of the topic.17 The most significant absorber is chloride, for which the author has measured a molar absorption coefficient of 3540 ± 140 M-1cm-1, in agreement with values reported elsewhere.13 This suggests significant absorption of 185 nm by chloride begins at concentrations above about two mg/L. The fraction of photons absorbed by major inorganic and organic solutes is significant, and their distribution will have important consequences on contaminant destruction. Investigations of the 185 nm AOP must adequately detail the composition of the matrix studied. If such major solutes suppressed radical generation by water photolysis, enough inhibitions of the process would render it infeasible in many cases. However, major anions – chloride and sulfate in particular – may actually contribute to contaminant destruction upon absorption at 185 nm, rendering a possible liability into a potential opportunity. Absorption by CTTS bands result in the ejection of a solvated electron that leaves behind a radical atom or anion with reported quantum yields comparable to that of water photolysis. In the case of bicarbonate, this generates the carbonate radical of generally much lower reactivity with most organic compounds relative to OH. In the case of chloride and sulfate, the products include the highly reactive radicals Cl and SO4-. The limited data available suggests that the reactivities follow the order Cl ≈ OH > SO4-.18 Evidence suggests that in the 185 nm regime, interconversion between OH, Cl and SO4- involves various equilibria, creating a mixture of reactive radicals that will depend on the composition of the water matrix. Each of these reactive species may contribute to the degradation of target contaminants to an extent determined in part by their relative reactivity with the target and aggregate background matrix composed of all other solutes (i.e. steady-state concentrations). For example, though SO4- may be less reactive to a specific contaminant than Cl and OH, if it is also sufficiently less reactive to the matrix, contribution of SO4- to contaminant destruction may dominate. Molar absorption coefficients at 185 nm (ϵ185) are not generally available, since most conventional spectrophotometers operate at wavelengths greater than 190 nm. Where instrument range extends to 185 nm, accurate results are difficult to obtain. First, since oxygen both absorbs strongly at 185 nm and generates ozone that could harm instrumentation, purging the optical path with nitrogen (transparent down to at least 150 nm) is essential. Second, the conventional UV source for spectrophotometers – the deuterium lamp – generates a substantial amount of radiation above 200 nm where aqueous samples are highly transparent. Finite slit widths and imperfections in diffraction gratings will allow small amounts of radiation at wavelengths other than the one of interest to reach the sample cell. For deuterium lamps, such stray radiant energy (SRE) overwhelmingly occurs at wavelengths longer than 185 nm and will usually pass the sample unattenuated to contribute to the detected signal. For strongly absorbing samples, this effect is particularly pernicious and produces spuriously low absorbance readings. For example, if a sample absorbed 90% of radiation at 185 nm, but 1% of the incident radiation was SRE, the true absorbance reading would be 1.00 while the apparent reading would be 0.96. If the SRE were 10%, the apparent absorbance would be 0.72. Measurements reported at 185 nm that do not explicitly account for SRE should be considered with caution. While no standard method exists to measure SRE at 185 nm, such a procedure could make use of a concentrated solution of NaCl (~ 4.0 M). While attractive, this approach applied to modern instruments would require significant modifications of hardware and software.19 In the author’s own work, the problem of quantifying ϵ185 was circumvented by not using a spectrophotometer, but instead a two cell photochemical approach and a quasi-collimated beam.13 Though laborious, the method produced satisfactory results. Other crucial aspects of the 185 nm AOP deserve further research. Important details regarding the interconversion and fate of the reactive species (OH, Cl, SO4-) are lacking and require greater elucidation, particularly in more environmentally relevant matrices. Necessary techniques to study such phenomena are beyond the capabilities of most engineering departments, suggesting the need for greater interdisciplinary cooperation. Another major deficiency in this area is the lack of reliable and convenient radiometry and actinometry capabilities to quantify radiation at 185 nm. Such tools are needed to express the extent of reactions in terms of energy, which not only allows meaningful comparison of results among researchers but is a critical element of reactor design. 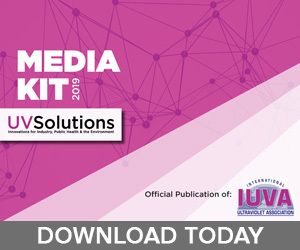 The author has contacted the relevant national standards labs of the US, Canada and the UK, and though no traceable radiometry standard at 185 nm was found, all three labs reported the capability to accommodate such a request. As for chemical actinometry, researchers have relied on a few methods that are inconvenient and rely on reported quantum yields that when traced to the original references suggest significant uncertainties.20 The author has examined at length the evolution of H2O2 generation in ultrapure water (18 MΩ-cm), saturated with air or O2, as a possible actinometer. This effort was abandoned due to poor reproducibility. Recent reports of its use utilized phosphate buffered solutions seemingly without considering the easily observed impact due to reactive phosphate radicals generated by CTTS absorption under such conditions.21 Re-examination of this system is recommended. Regardless, an aqueous actinometer that is insensitive to 254 nm radiation and whose products may be accurately quantified after a few minutes of exposure would be a great asset to the advancement of this subject. The same is true for a radiometer that can be calibrated to a traceable standard. Despite these knowledge gaps, 185 nm is already a useful tool. 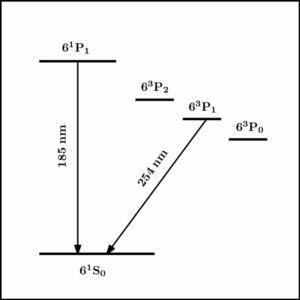 The author has used a compact 185 nm quasi-collimated beam to measure the second-order OH rate constants of compounds, such as geosmin and 2-methylisoborneol, by competitive kinetics with high precision. Unlike methods using O3/H2O2 and UV/H2O2, no chemical addition is required to start the reaction, eliminating one of the largest sources of error. A 185 nm AOP reactor system is already commercially available for the mineralization of total organic carbon (TOC) in the production of ultrapure water. 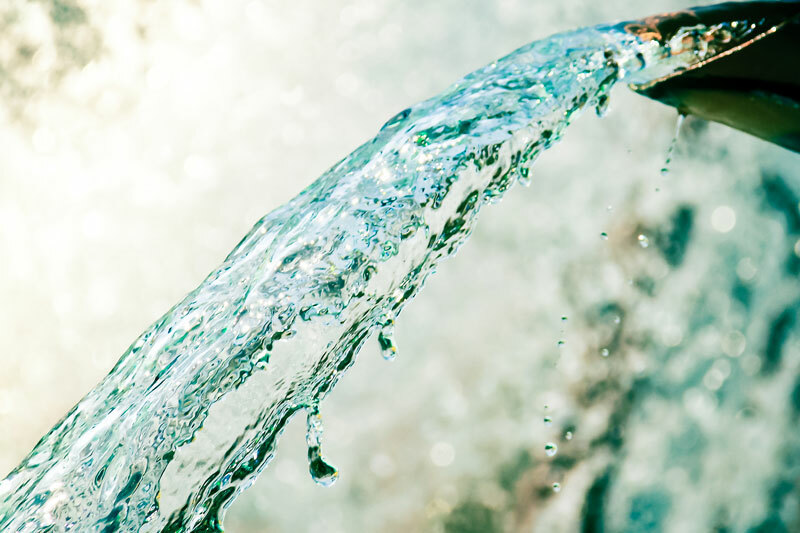 Additional work to extend this process to the humble task of drinking water treatment promises a new tool using a UV solution. Glaze, W. H., Kang, J. W., & Chapin, D. H. (1987). The chemistry of water treatment processes involving ozone, hydrogen peroxide and ultraviolet radiation. Ozone: Science and Engineering, 9(4), 335 – 352. Quickenden, T. I., & Irvin, J. A. (1980). The ultraviolet absorption spectrum of liquid water. The Journal of Chemical Physics, 72(8), 4416-4428. Weeks, J. L., Meaburn, G. M. A. C., & Gordon, S. (1963). Absorption coefficients of liquid water and aqueous solutions in the far ultraviolet. Radiation Research, 19(3), 559-567. Getoff, N., & Schenck, G. O. (1968). Primary products of liquid water photolysis at 1236, 1470 and 1849 Å. Photochemistry and Photobiology, 8(3), 167-178. Buxton, G. V., Greenstock, C. L., Helman, W. P., & Ross, A. B. (1988). Critical review of rate constants for reactions of hydrated electrons, hydrogen atoms and hydroxyl radicals (⋅OH/⋅O−) in aqueous solution. Journal of Physical and Chemical Reference Data, 17(2), 513-886. Westerhoff, P., Aiken, G., Amy, G., & Debroux, J. (1999). Relationships between the structure of natural organic matter and its reactivity towards molecular ozone and hydroxyl radicals. Water Research, 33(10), 2265-2276. Haag, W. R., & Yao, C. D. (1992). Rate constants for reaction of hydroxyl radicals with several drinking water contaminants. Environmental Science & Technology, 26(5), 1005-1013. Beckey, H. D., Groth, W., Okabe, H., & Rommel, H. J. (1964). Die Bestimmung der Lichtintensität von Niederdruck-Quecksilberlampen bei 1849 Å. Zeitschrift für Naturforschung A, 19(13), 1511-1513. Waymouth, J. F. (1971). Electrical Discharge Lamps. MIT Press. Noyes, W. A., & Leighton P.A. (1941). The Photochemistry of Gases. Reinhold Publishing. Furatian, L. (2017). The Use of 185 nm Radiation for Drinking Water Treatment (Doctoral dissertation, University of British Columbia). Furatian, L., & Mohseni, M. (2018). Influence of chloride on the 185 nm advanced oxidation process. Chemosphere, 199, 263-268. Furatian, L., & Mohseni, M. (2018). Inuence of major anions on the 185 nm advanced oxidation process-Sulphate, bicarbonate, and chloride. Chemosphere, 201, 503-510. Furatian, L., & Mohseni, M. (2018). 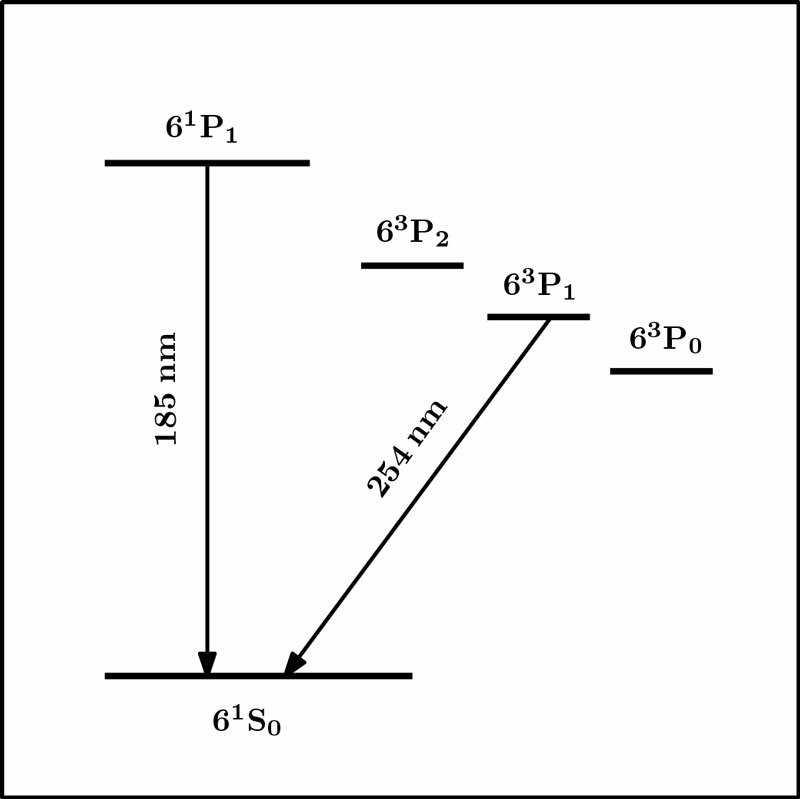 Temperature dependence of 185 nm photochemical water treatment–The photolysis of water. Journal of Photochemistry and Photobiology A: Chemistry, 356, 364-369. Zoschke, K., Börnick, H., & Worch, E. (2014). 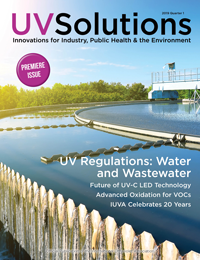 Vacuum-UV radiation at 185 nm in water treatment – a review. Water Research, 52, 131-145. Buxton, G. V., Bydder, M., Salmon, G. A., & Williams, J. E. (2000). The reactivity of chlorine atoms in aqueous solution. Part III. The reactions of Cl• with solutes. Physical Chemistry Chemical Physics, 2(2), 237-245. Von Sonntag, C., & Schuchmann, H. P. (1977). Photolysis of saturated alcohols, ethers, and amines. Advances in Photochemistry, 59-145. Yang, L., Li, M., Li, W., Bolton, J. R., & Qiang, Z. (2018). A Green Method to Determine VUV (185 nm) Fluence Rate Based on Hydrogen Peroxide Production in Aqueous Solution. Photochemistry and Photobiology, 94(4), 821-824.